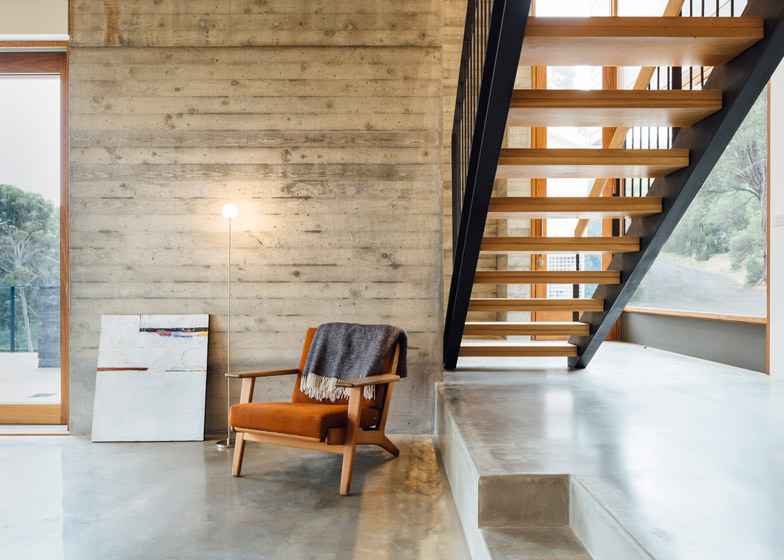 The timber-clad end of this house near the Australian city of Ballarat cantilevers over the edge of a concrete block base to provide impressive countryside views from the main living space (+ slideshow). 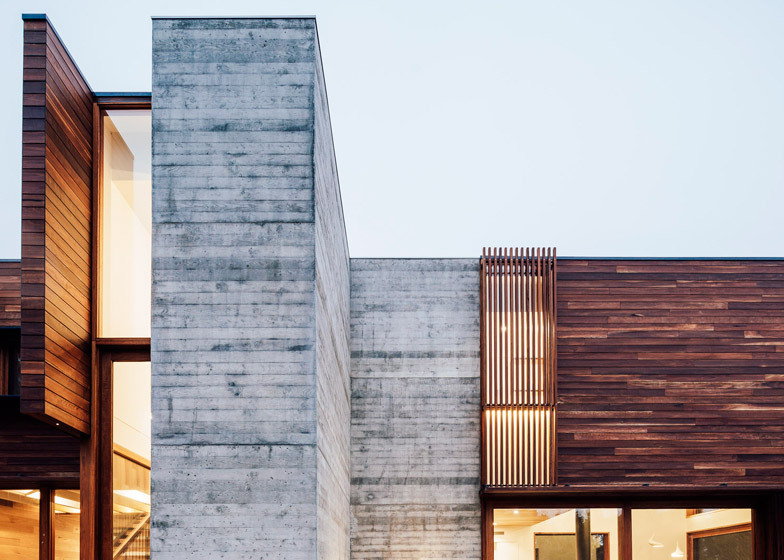 The house is situated in the Invermay district to the north of the city and was designed by local office Moloney Architects for a family of six who wanted a residence that draws attention to its rural setting. Rather than the single-storey layout originally proposed by the architects, the owners specified that the bedrooms should be located on the first floor to recall the houses they were used to in their native Ireland. 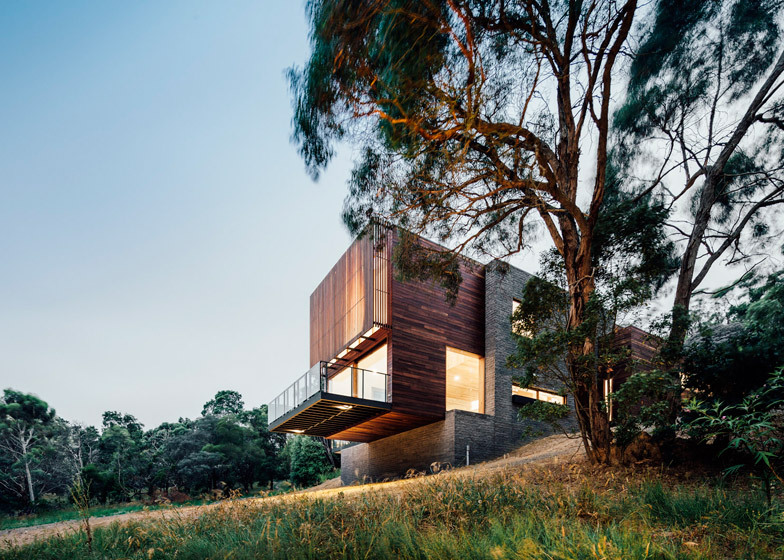 "The trouble with this approach was that from the flat area of their site the panoramic views were only visible once you were on the upper level," explained architect Mick Moloney, who runs the studio with his wife, Jules. "The upstairs bedrooms would have great views, but the downstairs living areas wouldn't." "We looked at various solutions including clearing the landscape to open up the views. In the end though, we decided to cantilever part of the house to bring the downstairs living areas far enough over the hillside to capture the views to the south west." Named Invermay House, the building is configured as a series of interconnected blocks. The internal layout was then organised around the views, the available sunlight, and the desire to facilitate a flow of air and conversation between the spaces. "We started off with a diagram of simple blocks representing sleeping, living and service spaces," Moloney explained. "We wanted the spaces to feel connected both horizontally and vertically, and arranged them in a linear form that would allow each space to have north-facing windows." 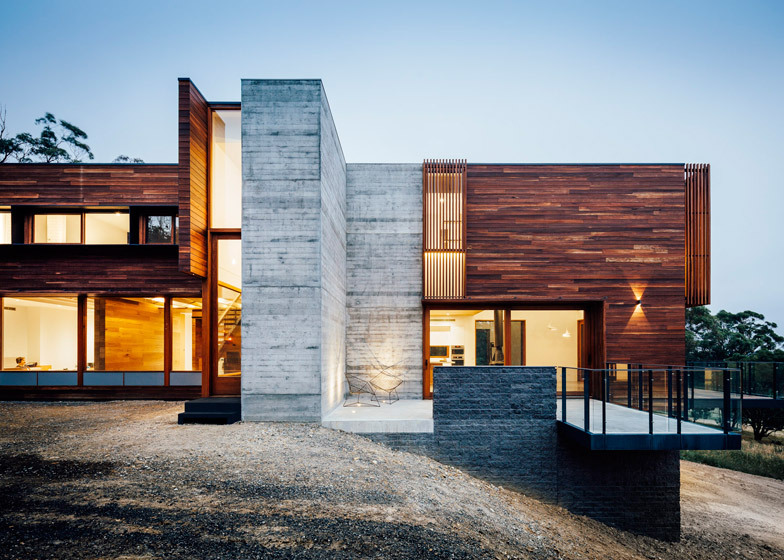 The building's volumes are expressed in different materials. 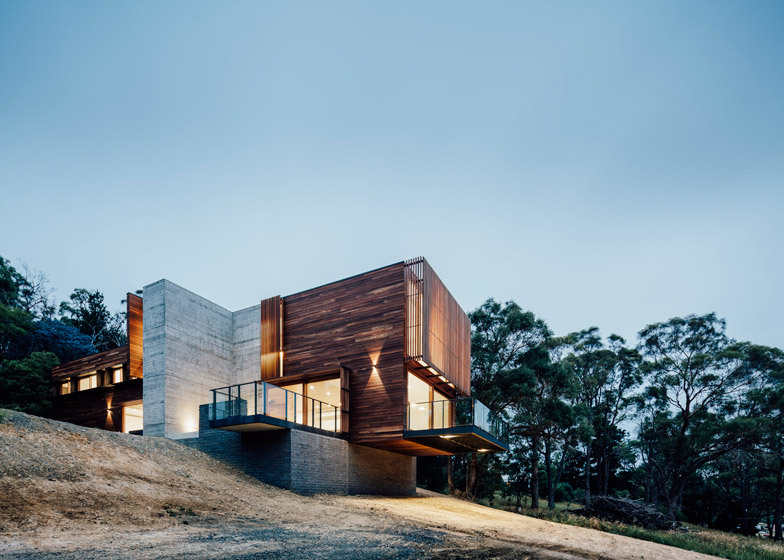 A solid foundation layer of dark split-face concrete blocks support boxes clad in concrete and spotted-gum boards with openings that provide light and views. 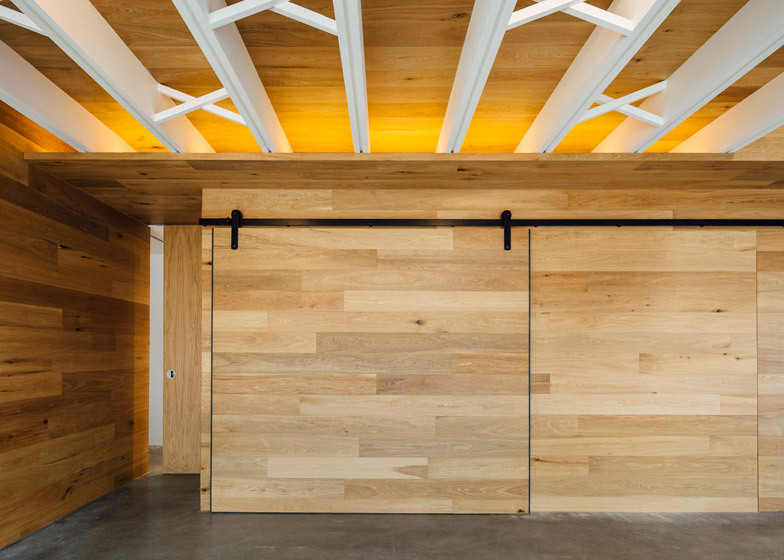 "The materiality of the facade references the internal spatiality – with bands of light referencing horizontal and vertical connections," added Moloney. 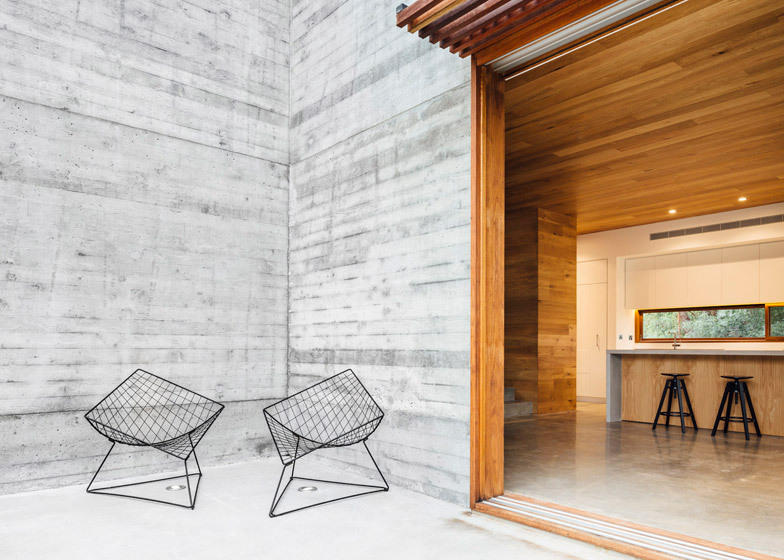 "The house uses off-form concrete and concrete blocks as a way of literally and figuratively anchoring the mass to the hillside." The house is oriented east to west and its long northern elevation incorporates plenty of glazing to take advantage of the north sunlight. On the upper storey containing the bedrooms, slatted timber screens are installed in front of some of the windows to provide privacy and shade. 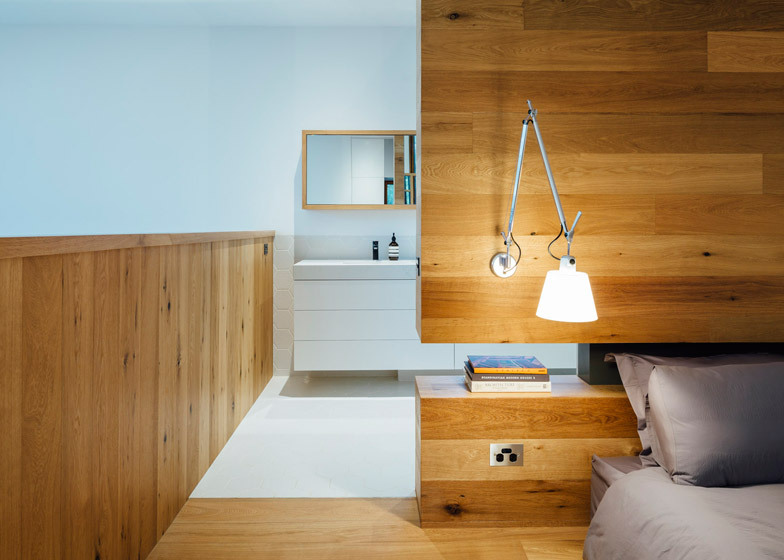 The children's bedrooms towards the rear incorporate a narrower band of openings. A double-height glazed entrance at the centre of the building opens into a reception area flanked on one side by a monolithic concrete wall. 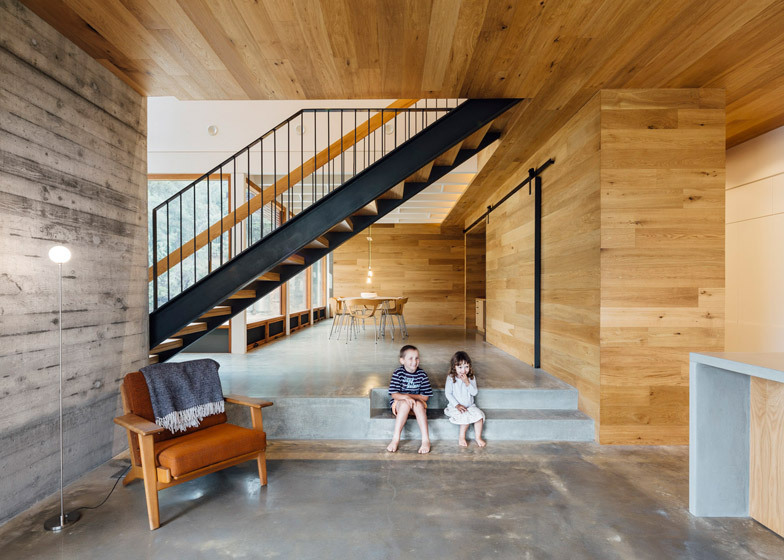 A wooden staircase with open treads ascends towards an oak-clad box containing the master bedroom. 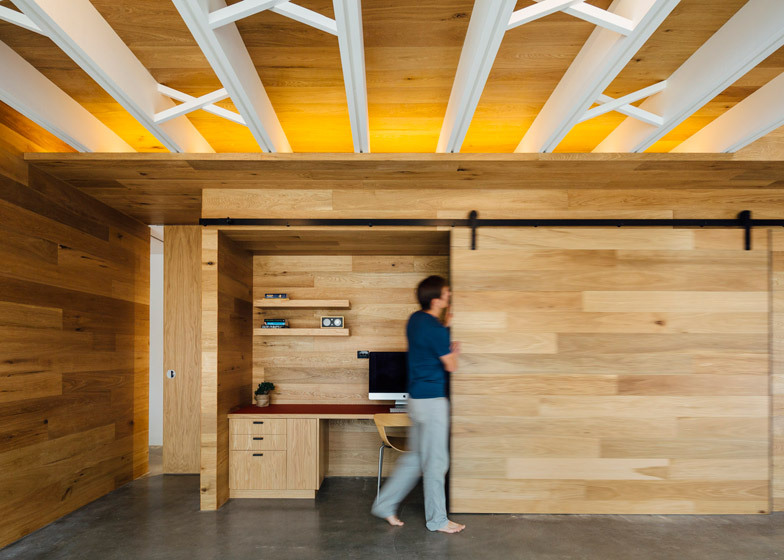 Sliding timber panels conceal a pair of study spaces on one side of a dining area adjacent to the entrance, beyond which is a playroom for the children and a garage. Large windows lining the open-plan living and kitchen area incorporate sliding doors that open onto decks oriented to the north and west. A void above the living room connects this space with the master bedroom and its en-suite bathroom on the first floor. 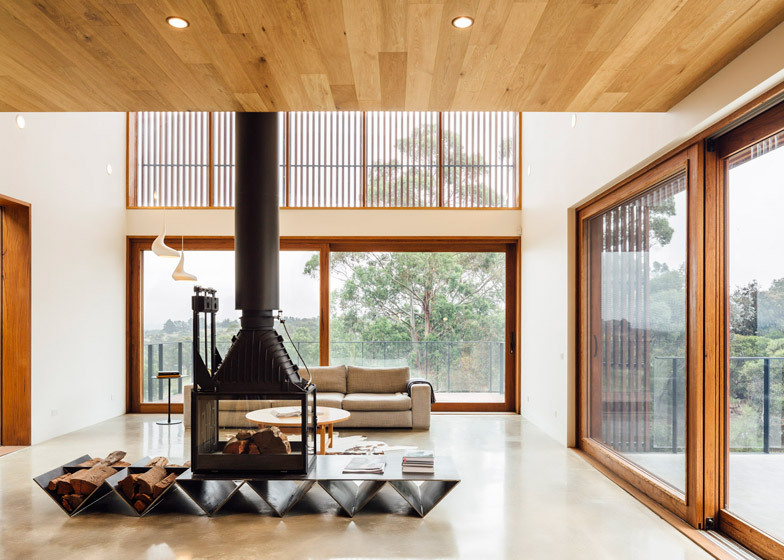 "When we suggested the idea of making the parents' bedroom open to the void above the lounge room we assumed they wouldn't go for it," Moloney recalled. "But they loved the idea of being able to communicate with the upper level. It really works for them." 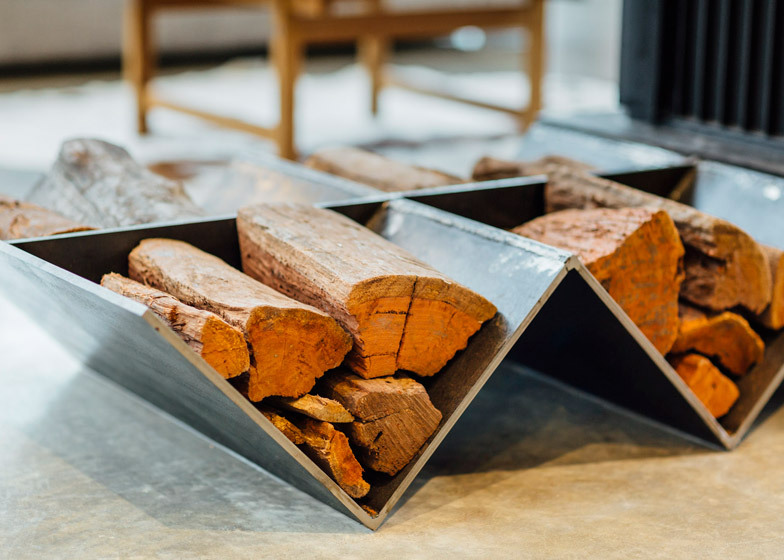 A wood-burning stove sits on a folded metal plinth in the centre of the living room, which also functions as a store for logs. 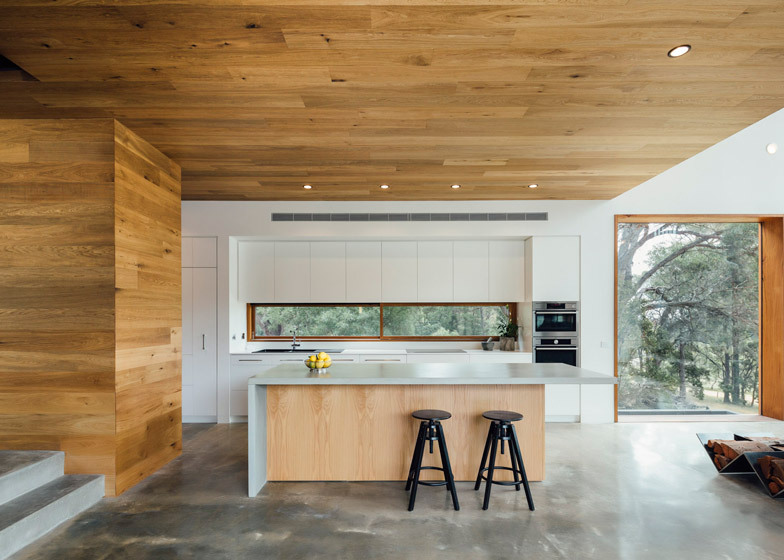 The stove's flue rises through the double-height void to reach the ceiling above. Photography is by Michael Kai.